the ad nor any information given during or after the sale. 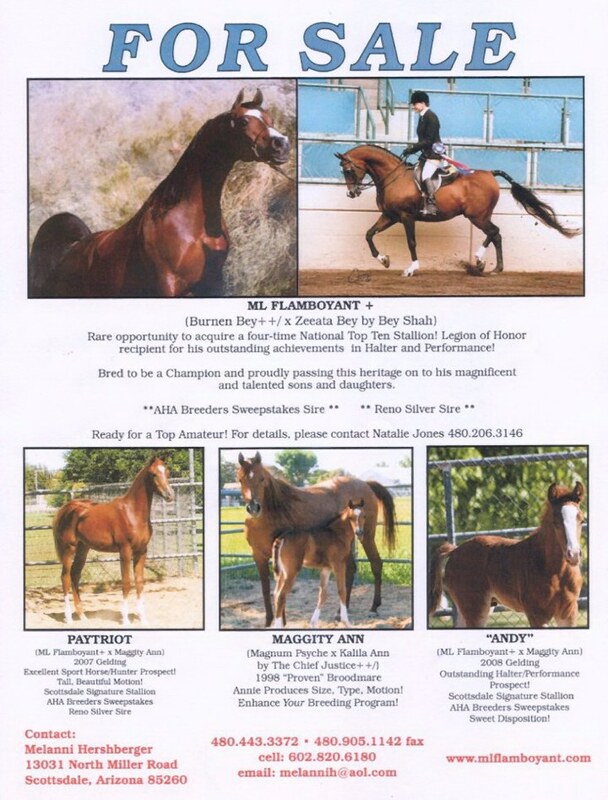 PLEASE CONTACT MELANNI HERSBERGER FOR INFORMATION ON THESE FINE HORSES. 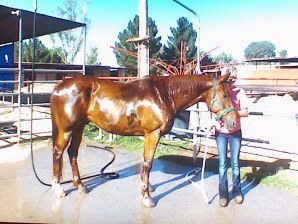 Scroll down to see " Maggity Ann"
15 hands high, sorrel, very gentle. 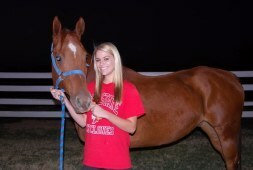 He has been owned by a teenager for the last two years. 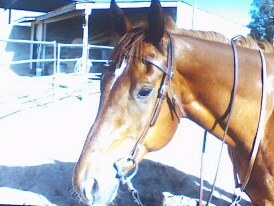 Owner took lessons on him in an arena and used him on trails. but an on-site lease option is available. Currently being leased. 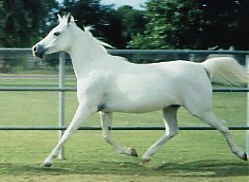 A 1998 imprinted gelding, Kaladdinn has been shown in Class A shows in halter always placing in the top five and in the new Arabian Sport Horse Division where he placed 2nd in his class -- Arabian Sport Horse Prospects, 2 Years and Under -- December 1999.
proud at this show -- he got Reserve Champion in Hunter Pleasure! He was ridden for the first time by Sarah, who boards her Quarter horse, Flip, here at the Rockin' D. Way to go Sarah and Kaladdinn!! What a way to end the show season! 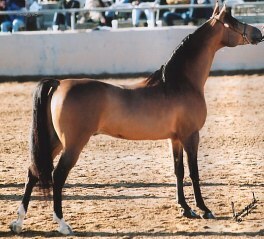 Sarah also showed Kaladdinn in Western Pleasure, Equitation and Open, placing 4th. 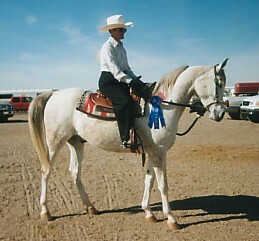 Western Pleasure Novice placing 4th. Thank you Virginia for showing him! At our last show of the season, Kaladdinn competed in three Western Pleasure classes, ridden by his most recent trainer, Bruce Novak. 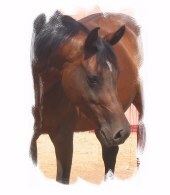 They placed 1st out of 4 in Western Pleasure Green Horse, 3rd out of 7 in Western Pleasure Open and 2nd in the Jack Benny Pleasure Class. At our first show of the season, Kaladdinn was partnered with a new rider and together they competed in several English Pleasure classes riding Hunt Seat. 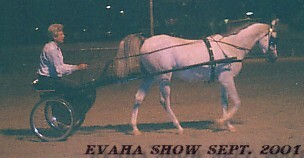 In these classes Kaladdinn placed 4th to 6th. He improved with each class, but his placings kept on going down!! 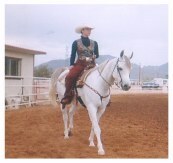 After about a 45-minute break, they went back for the "Jack Benny Class" in which all the exhibitors rode Western except for them! Kaladdinn was "good as gold", going forward well, light in the bridle and taking his canter departs perfectly. 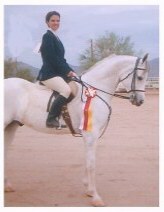 He was rewarded with a blue ribbon!! Kaladdinn, we are thrilled - let's do it again at the next show! Kaladdinn has just competed in his first performance class and he took 5th Place out of a class of 18 in the Huntseat Novice Horse and/or Rider class at the VSAHA show -- way to go Kaladdinn -- we were so proud of you! 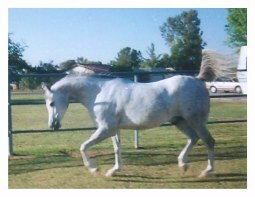 You acted as if you had been in the show ring for years and even though you were probably the youngest one in the group you demonstrated your athletic abilities beautifully. And this was with less than 60 days training. Can't wait to see what your future will hold! Kaladdinn is also working well in a bosal in Western Pleasure and is being trained for carriage driving (See results below). He is now going over cavallettis. 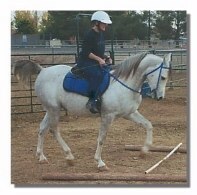 Each new skill is taken in a quiet and relaxed manner and he seems to really enjoy new challenges. 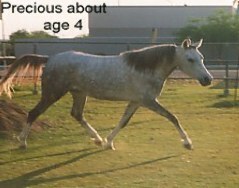 It's Hy Tyme Kadi (7/8 Arabian Grey Mare) is more generally known as "Precious" since she was so tiny when she was foaled. 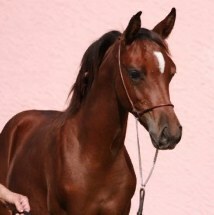 She is Crabbet (Raseyn, Abu Farwa, Aarief, Fershan) with a shot of Quarter Horse. 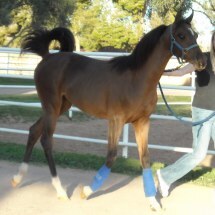 SOLD--We want to wish her new owners all kinds of fun and success with her! I own her Mom who is 26 years old and I would love to find Precious!